This year’s tomato harvest at Creekview Farm was never ending! From San Marzano’s to beautiful Herilooms, we had enough harvest for two large batches of tomato sauce, two large batches of bloody mary mix, endless caprese salads and beyond. To help me warm up on these cooler nights, I decided to pair our homemade tomato sauce with a simple gnocchi recipe topped with shaved Pecorino and fresh herbs. I started off by pureeing the tomatoes using our super old-fashioned tomato food strainer (I remember my Mom using this all the time as a kid). The strainer helps separate out the skins and seeds, while keeping the yummy pulp and juices. And what I love most about making tomato sauce is the fact that you really can make it your own and add in whatever herbs, vegetables and seasonings you want. For this sauce, I kept it very simple by adding in a few chopped vegetables and herbs and letting it simmer all day on low until it reached the perfect consistency. Add chopped vegetables and garlic to a large heavy pot over medium heat, add olive oil and cook for about 5 minutes (be careful not to burn the garlic). Add tomatoes, chopped herbs of your choice, 1-2 bay leaves and sea salt and simmer on low heat until tomato sauce has darkened and you’ve reached your preferred consistency. I simmered mine for about 8 hours on low – make sure you are constantly tasting the sauce through out the day, adding in more herbs if you desire. Season sauce with more salt and freshly ground pepper. Store in an airtight container for a week in the refrigerator or 3 months in the freezer. TIP: when freezing, make sure you freeze in 2-4 serving portions. Begin by boiling the potatoes (skins on) until soft and tender. While they are still warm, peel them and pass them through a potato ricer (if you don’t have a ricer, you can use a hand masher or fork – just be sure to not overwork the potatoes). Gather the potatoes into a mound and form a well in the center. Add the egg and salt and begin to mix together with a fork, gradually adding in the flour. Once mixed, begin to knead the dough gently until dough is slightly dry to the touch. Form dough into log and slice off 1-inch pieces. Take one of the pieces and roll into a rope about 3/4 inch in diameter. With a sharp knife cut the rope crosswise every 3/4 inch. Continue the same process with the rest of the dough. Bring a large pot of water to a boil. Once ready, drop in the dumplings for about 2 minutes (they will begin to float). Remove them with a slotted spoon and transfer them to an ice bath to stop the cooking. Remove them quickly from the bath and drain on a paper towel. When ready to serve, heat your sauce and toss gently with the gnocchi. Garnish with freshly shaved Pecorino or Parmigiano-Reggiano and basil. Enjoy with Sangiovese or Merlot. While planning my friend’s Bridal “Meet and Greet” on Pinterest, I came across this easy-to-make pasta recipe from How Sweet It Is Blog, the perfect dish for a rainy night in. Traditional pasta carbonara is made by coating pasta in a rich and creamy sauce of whole eggs, Parmesan cheese and pork. We elevated this traditional dish, by adding one of my favorite vegetables – Brussels sprouts! The sprouts added a nice rich, sweet and nutty flavor to the pasta. Fry the bacon in a large skillet over gentle heat until crisp. While bacon is cooking, begin boiling the water for the pasta and cook according to the package directions. Once bacon is crisp, transfer pieces with a slotted spoon to a paper towel lined plate to drain. Remove half of the bacon grease with a large spoon and set aside in a bowl. Add Brussels sprouts to the same skillet and cook on medium heat for 6-8 minutes. (You want the Brussels sprouts to caramelize a bit, so cook without stirring for at least 4 minutes. Stir and continue cooking for 2-4 minutes). Add the minced garlic to the sprouts and cook for one more minute. Remove sprouts and set aside in bowl. In a separate bowl, whisk together the whole eggs and gradually add the cheese. Add a small dash of salt and pepper (you can add more later to the cooked pasta). When the bucatini is cooked, drain pasta (reserve some pasta water, just in case **), add the reserved bacon grease to pot and heat on low. Add cooked pasta back into pot and coat with grease. Remove pot from heat*** and add the egg/cheese mixture, tossing several times until fully coated. Quickly add the bacon, Brussels sprouts and additional pepper / salt if needed. Garnish with additional Parmesan cheese. **If needed, add a few splashes of reserved pasta water to help loosen the sauce. ***It’s important that the pot has been removed from the heat otherwise the egg/cheese mixture will curdle. The heat from the pasta is sufficient to cook the egg mixture. Thanks to Jessica Merchant from How Sweet It Is Blog for the beautiful recipe. Yield 4 servings. We finally received some much needed rain here in Northern California a few weeks back. For a minute there, I forgot it was winter with all of the beautiful, warm days we’ve experienced in December and January. It was a Friday night and I had planned for my dear friend Morgan to come over and make dinner together. That morning over text we both had same idea for dinner: SOUP! What a perfect choice to pair with this rainy evening. 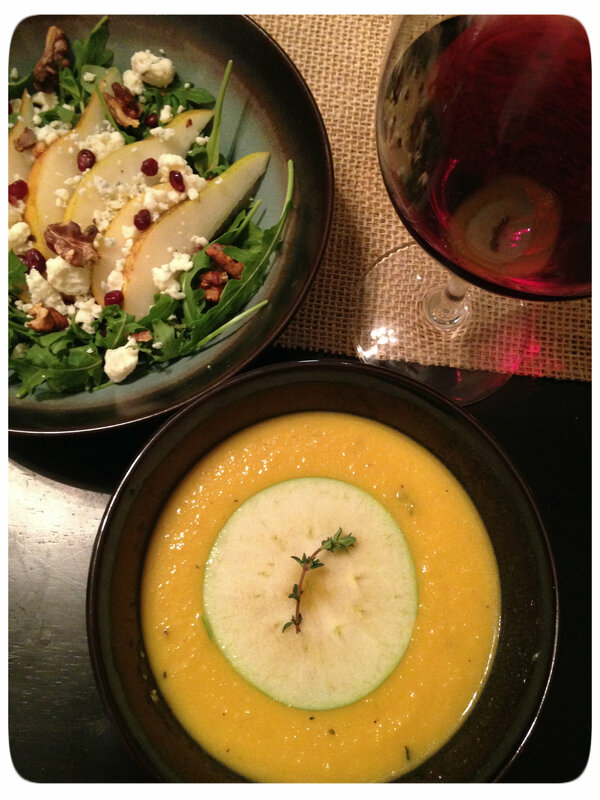 She had a few ideas that we kicked around and then we both settled on making a comforting squash soup with granny smith apples paired with a pear & pomegranate salad. 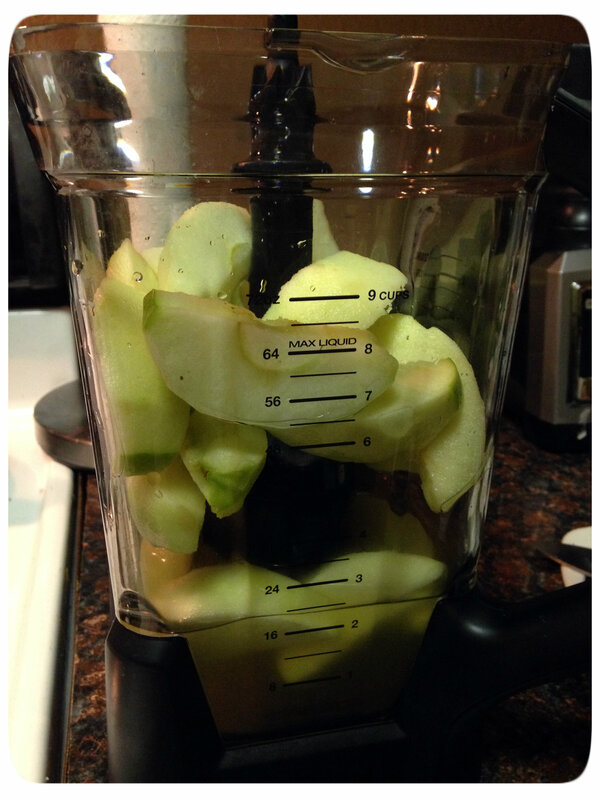 Add the apples and 2 cups of broth into a blender or food processor (I used my Ninja and it worked great!) Puree until smooth and transfer it to a bowl. Set aside. In a heavy stockpot, add olive oil, onions and garlic and saute over medium heat until softened, about 5-7 minutes. Remove the onions from pot and place in a bowl. Transfer the apple / broth mixture to the stock pot and simmer. 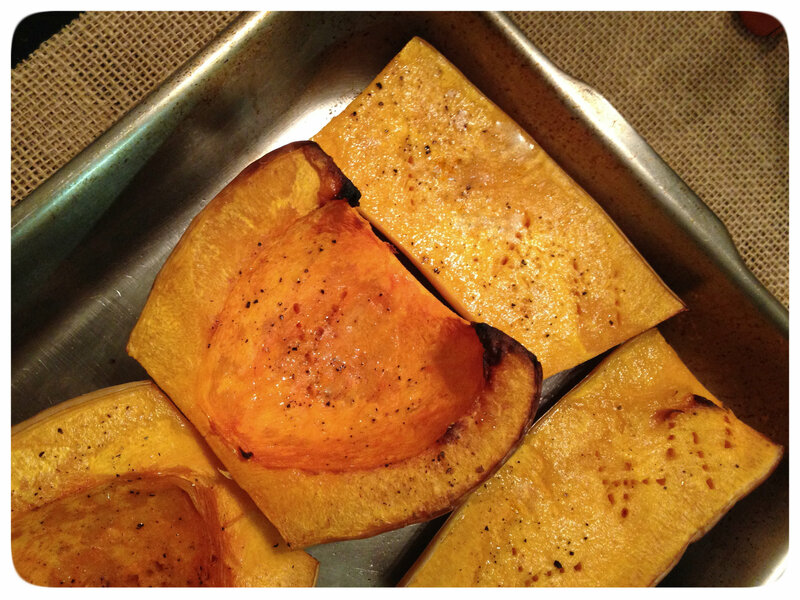 Add the cooled squash to the blender along with 1/2 cup of broth and puree until smooth. Add the squash puree to the apple / broth mixture. Add the half & half and stir continuously until completely mixed together. Add the fresh thyme and ginger. Season with salt & pepper, to taste. 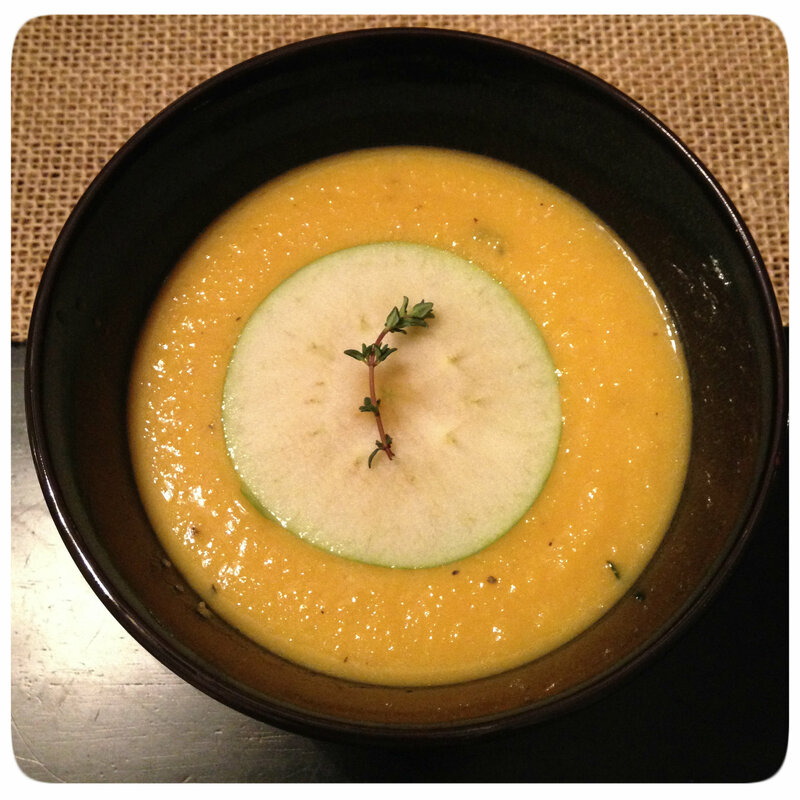 Garnish soup with thin slices of apples & fresh thyme sprig. Enjoy with your favorite salad or crusty bread. 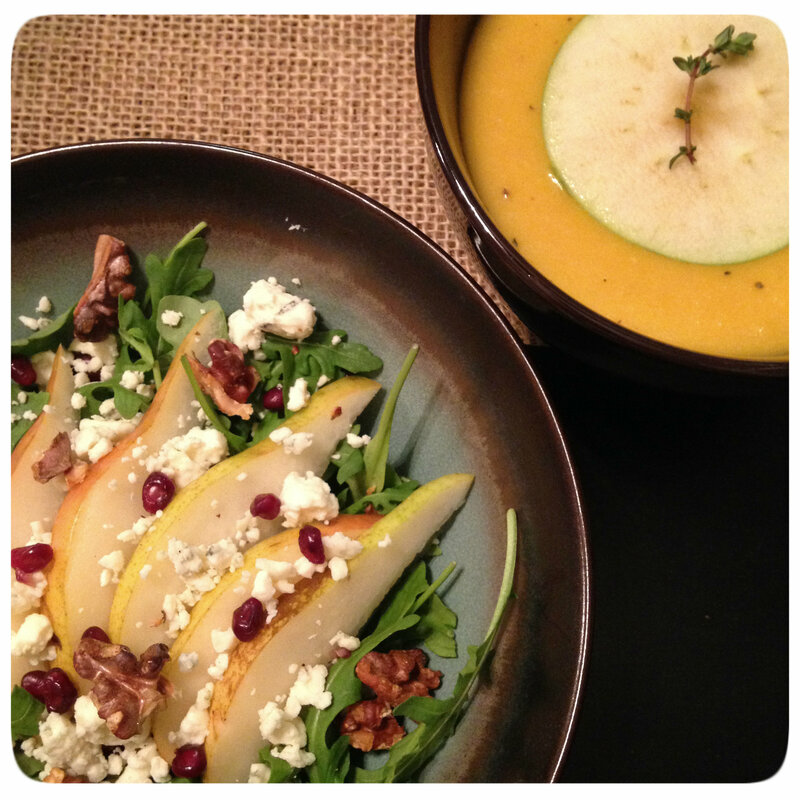 Combine pears, cheese, pomegranates and toasted walnuts over a bed of arugula salad. To make this simple vinaigrette, combine juice from 1 orange, 1/2 tablespoon white wine vinegar, 1/4 cup olive oil (slowly added), salt & pepper.